You will earn 3,284 Reward Points. Earn 1 reward point for every 1 dollar spent. US Range designed these heavy duty counter hot plates for high-volume production while offering the flexibility to match up with a full counter lineup. 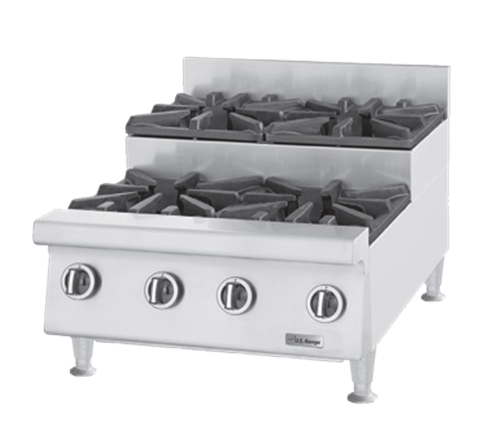 Models available with 2, 4, 6 and 8 open top burner combinations. Available in nominal imperial widths 24” (600mm) to 48”(1200mm) with 19-13/16” (503mm) height, and 32” (814mm) depth. Split ergonomic cast iron grates protect pilots from spill-overs, and are easy to handle and clean. Each individually valve-controlled burner is rated at 30,000 BTU/h (8.78 kW) natural gas or 26,000 BTU/h (7.61 kW) propane gas. Stainless steel front, sides and back with large capacity stainless steel crumb tray. For use with Natural or Propane gas only. Gas input ratings shown for installations up to 2000 ft., (610m), above sea level. Please specify altitudes over 2000 ft. and gas type when ordering. Garland/U.S. Range products are not approved or authorized for home or residential use but are intended for commercial applications only. Garland/U.S. Range will not provide service, warranty, maintenance or support of any kind other than in commercial applications.